Looking for flowers for your wedding or special event? Ladyfern Flowers offers seasonal bulk blooms for those interested in getting creative with their own floral work. Visit our DIY wedding page for more specific wedding information. Our ‘Bulk Blooms’ floral buckets are full of beautiful, seasonal flowers direct from our farm fields at Two Pony Gardens. Our local, organically grown, speciality cut flowers are always top quality and incredibly long lasting. 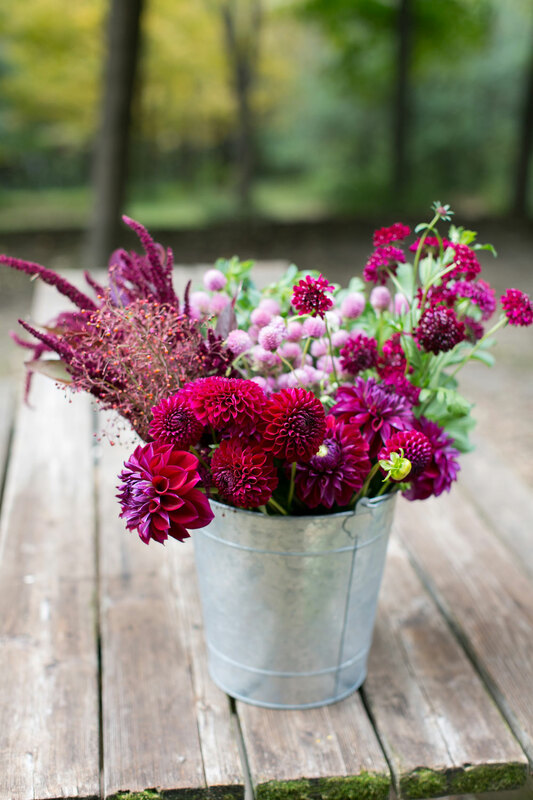 The benefits of purchasing quality grown, local flowers that are properly harvested will show in their appearance and their vase life, which far exceeds those of imported flowers. Beautiful cut flowers grown locally just for your special day? Can’t beat that. The DIY option works best for those who are flexible with their flower types and vision! These are sold as loose flowers, they are not pre-arranged or designed, if you would like your florals arrangements designed, please fill out our wedding inquiry form. ‘Bulk Blooms’ are available to order from mid June - September. A minimum order of $200 for bulk blooms is required to pre-book, average bulk blooms expenses for an event of 150-200 would be $400-$600. If you are wanting to make a specific flower and color request, they are sold by the bunch depending on what is in season. Please inquire for pricing and our availability list. Fill out our ‘Bulk Blooms’ inquiry form by selecting you order, date and palette request. You will be contacted within 72 hours of your inquiry about purchasing our blooms as we have a limited amount available each week, so it is best to book ahead to secure your flowers. After your order is confirmed, you will be sent an invoice to pay 50% of your florals to secure your date, then you are booked! You will receive follow up notification of your order two weeks before your date to confirm details and receive your final invoice. We ask you to pay electronically before picking up your order at the farm as pick up can be self-serve if we are out working at another event or in the fields. On your selected pick up date, your florals will be harvested and ready to go for you in our walk in cooler at the farm. We will label the bulk blooms with your information and you can collect your floral buckets to start making beautiful arrangements!